Dubai: The UAE, where international singers come to perform, will witness the performance of a unique vocalist on Friday — a street singer. Babubhai, a Gujarati street singer who sang his way to stardom in the south Indian state of Kerala, is set to perform along with his family at a show in Sharjah this evening. Playing a dholak (a two-headed hand drum) and singing old Hindi songs, Babubhai has won several hearts and also a television reality show, thus becoming the face of contemporary street singers in Kerala. Though his parents hailed from Ahmedabad in the western Indian state of Gujarat, he was born and raised in Kozhikode in Kerala. Now 61, Babubhai said his official name is Babu Shankar, the latter being his father’s name. He lived with his parents till he was about 25. He found his perfect partner in one of his distant relatives, Lata, who also became his harmonium player and occasional co-singer. The couple moved to a rented house after they had three children, a son and two daughters. “But we never had any document to prove our identity as the house owner did not allow us to use that address in such documents,” said Babubhai. They finally moved into a new house, which they could call their own, in 2011 — two years after Babubhai started taking part in a television reality show featuring street singers in Kerala. Aired by former Malayalam channel Indiavision, the popular show gifted each of the 17 participants a house, though Babubhai became the first prize winner. By then, the couple had two more children who had started going to school. The three older children have got married and started their own lives away from their parents. 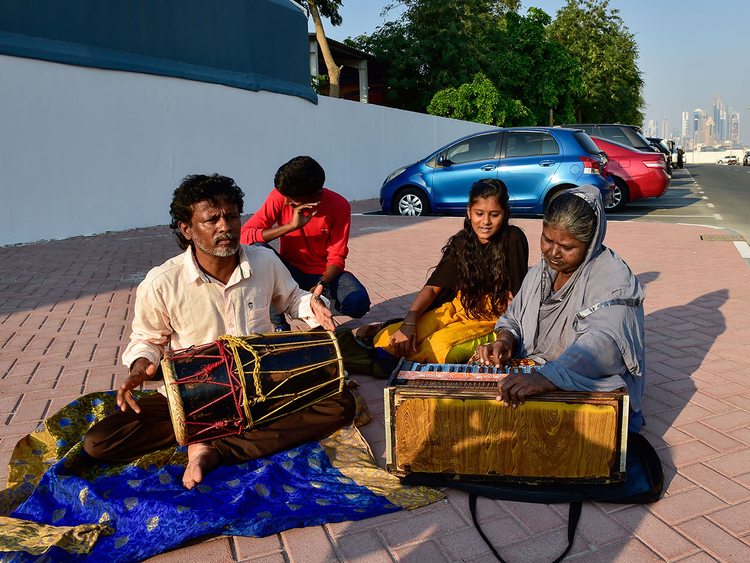 However, the couple still sings in the streets of Kozhikode to earn a livelihood for them and their younger children — Anil, 16 and Kousalya, 13, who have accompanied them to the UAE for the show. Kousalya occasionally joins her parents in singing Malayalam songs and Anil dances to their tunes if they are performing on a stage. It was only after the TV show that the family started getting some formal venues for performance. Since that is still not their main source of income, they have to go back to the street to make both ends meet. Two months ago, they faced eviction from Kozhikode’s popular Mittai Theruvu (Sweetmeat Street). Hundreds of their fans, including the local legislator and former minister M.K. Muneer, stood by them, forcing the district collector to give special permission to Babubhai and family to perform on the street. Advocate Shaji. B, convener of the Sharjah show of Babubhai, said a group of art lovers here also felt the need to support Babubhai and arranged the event. “In many western countries, street singing is promoted as part of tourism. However, the very few like Babubhai in Kerala are still facing issues,” he said. 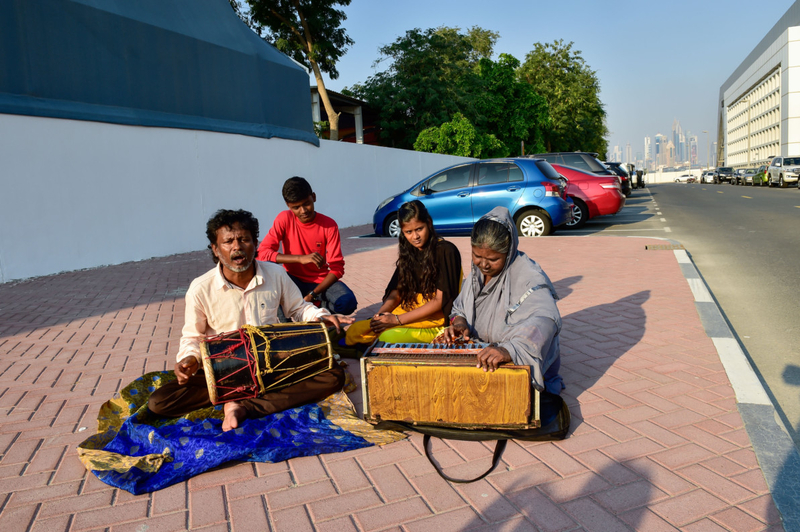 Though Babubhai and family volunteered to pose for photos and a video by singing on a street outside Gulf News office, their actual show will be held in Rayan Hotel in Sharjah. “We are trying to give the ambience of street singing by providing the apt backdrop,” said Shaji. The entry is free to the show that starts at 5:30pm.